Only one week after seeing Cockneys vs Zombies, I found myself watching Cockneys vs Robbers. Honestly, you wait years for a film with Alan Ford in, then two come along at once. The original TV series of The Sweeney managed to provide a mix of exciting (and fairly explicit, for the time) violence with relatively gritty plots. The new film, directed by Nick Love, aims for a similar blend. In other respects, though, similarities with the original are largely coincidental. Where the TV series dealt in miserable looking backlots and warehouses (it was, let’s remember, the principal source text for Life on Mars) the film treats us to repeated shots of London’s glittering skyline, international banking names prominent on the skyscrapers. Ray Winstone and Ben Drew step into the shoes of John Thaw and Dennis Waterman as Regan and Carter, the aging maverick hard man and his acolyte. In the film, their partnership is augmented by a team of flying squaddies – Sweeney Toddlers? – who are carefully cast to ensure gender and ethnic diversity. This allows the viewer to have fun trying to guess which one will die three quarters of the way through the film. Among them is Hayley Atwell, who is having an affair with Regan; not his smartest move, as she’s married to the internal affairs cop (Steven Mackintosh) currently investigating the Sweeney. The plot? Well, there’s a particularly nasty bunch of villains knocking over banks and jewellers; during one such robbery, a customer is shot in the back of the head. Regan isn’t having that – not on his patch, not while he’s Sweeney – which is the cue for lots of shooting and running around. Though the TV show was produced in the 1970s, the screenplay feels born of the 1980s. The generous quantity of macho posturing seems to stem from that decade (Regan’s constant banging on about he’s doing what has to be done might lead the uninitiated to assume he was originally played by Kurt Russell rather than John Thaw), as does the enormous number of bullets strewn around London’s streets. A foot chase that takes in some very familiar landmarks inevitably brings Heat to mind. It’s slightly odd seeing an avowedly American-style thriller that incorporates the likes of Trafalgar Square. The 80s mentality is also manifest in the film’s concern with visual gloss – you certainly can’t imagine the 70s police occupying the vast, gleaming office space enjoyed by the movie Sweeney. The handheld camera and frenetic chases are more resonant of the Bourne movies (as are the Big Dramatic Strings on the soundtrack), while never, of course, being anywhere near as good. It’s a slicked-up version of the source material aimed principally at a generation who won’t have heard of, let alone seen, the original series. (Weirdly, it does quote the series’ best-remembered line, though in a peculiar context – there are clearly no trousers readily available for the arrestee to put on.) 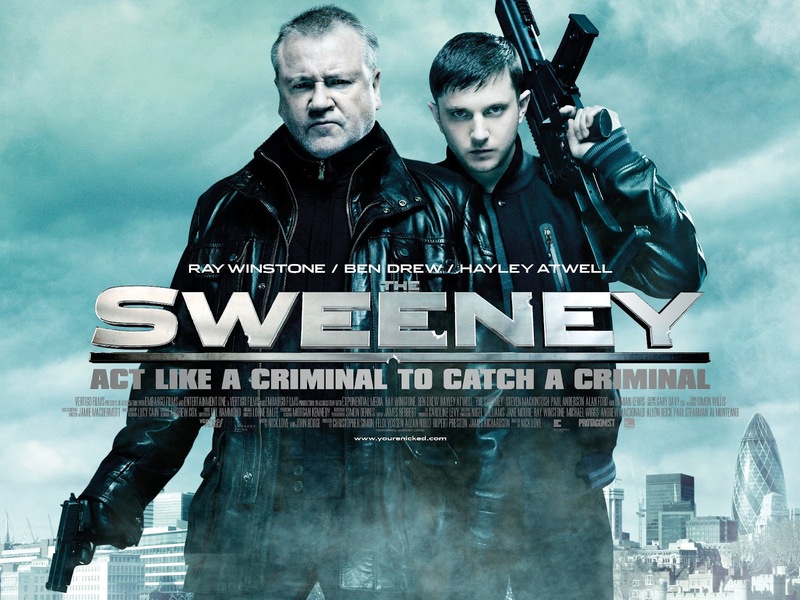 Taken on those terms, The Sweeney certainly delivers the goods. Whether their evident hope for sequels comes to anything remains to be seen, but I wouldn’t bet against it. This entry was posted in Reviews and tagged Ben Drew, Hayley Attwell, Ray Winstone, The Sweeney on September 10, 2012 by Gareth Negus.